This is a printable coupon for Wasa. You can find this coupon on Save.ca’s website. 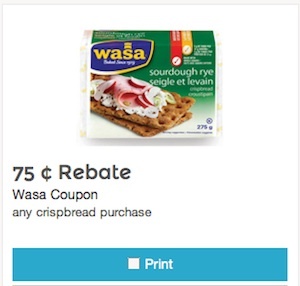 Wasa coupon is a $0.75 rebate on any Wasa crisp bread purchase. There are many different flavours of crisp bread including Wasa Ligh Rye, Wasa Sourdough Rye, Multigrain, Hearty Rye, and Fibre Rye. Wasa coupon is valid only in Canada and used in any major supermarket. 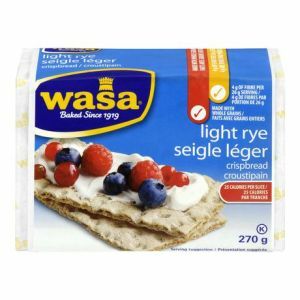 You can find Wasa crisp bread at Walmart, Loblaws, No Frills, and more. Wasa Crispbread’s whole grain crunch is a satisfying foundation for healthy snacking. Top it with a slice of cheese, fresh vegetables, even peanut butter. Whatever takes you to snacking nirvana.